1) Make sure the computer you are about to install the software on meets at least the minimum requirements posted online and on the back of the package. 2) Read the manual file that loads during installation. 3) Check that your Windows resolution matches your SimuRide Resolution (see Manual). * Complete the first four steps to configure your pedals (on-screen instructions). Select default for the rest of the functions or set each one manually to your liking. Default controls are listed in the manual. 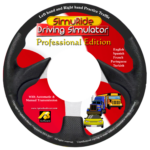 Here is a small patch (download here) for SimuRide HE 2010 version. The SimuRide HE 2011 already has this patch installed. You have the 2011 version if you had the choice of Left- or Right – Hand – Driving. This update offers you the option to connect more than one controller at the same time and install additional elements to practice the parallel parking. It also installs visual gauges (yellow bars) in the Steering Configuration program (see above list to find this program) that should react when you press your pedals and move your wheel. Press “Start” to begin manually configuring your pedals. If the yellow bars do not respond when your pedals are pressed, please check that your device is compatible with your computer and that you have the proper steering device software installed. Please see “My steering wheel or pedals are not responding to SimuRide” question for more details. If your Force Feedback doesn’t work, here is a small file that should fix the problem (download here) for SimuRide HE. If your problem is related to the accompanying hardware, and is not related to SimuRide software, it is recommended to contact the manufacturer of the product, located on the box or online. Q: I bought the two disc bundle of SimuRide Home Edition with Road Rules, but there’s only one disc in the case, where’s the second one? A: There is an insert in the case providing manual installation instructions; the second disc is beneath this slip. Q: I get the error message “Wrong disc inserted. Please insert the CD/DVD”. The right CD is in the computer. A: This can be solved by opening the program through “My Computer”, selecting the disc drive, and running the program. You can continue to select your languages and traffic direction here. The encryption that protects the disc may cause some versions of Windows to read it incorrectly and give you that error message. You will still be able to run the program. Q: SimuRide HE goes back to the main menu when I click Start, a “Viewer HE” screen appears over the logo, and the program locks up. A: Close and reopen the program. In the main Menu please select “Setting” and change the Full Screen to Windowed option. This should solve the problem. Sometimes other processes take over the Viewer HE (SimuRide program), depending on the priority setup during the OS installation. For example your task bar can go over other programs. In this situation please right click mouse on the task bar, select “Properties” and uncheck the option “Keep your task bar on top of other windows”. Q: I am getting a blank screen after I start the SimuRide Home Edition practice drive. If you are still experiencing problems, check that appropriate driver has been installed for your graphics card (if new, the manufacturer should provide this on CD). Otherwise, run the SimuRide HE on a computer that has at least the minimum requirements. Q: I cannot start my car. “Starting the engine, always press the brake pedal” message is flashing when I begin to drive. I am pressing my brake pedal but I cannot start my engine. 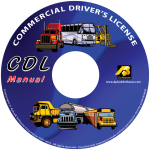 A: See the checklist at the top of this page “To Ensure Successful Installation of SimuRide HE” and make sure you have completed the separate program called Steering Wheel Configuration in the A+B Software folder. After this is completed, go back to SimuRide HE and select Start. Consult the manual for starting your engine. Q: My steering wheel or pedals are not responding to SimuRide. How do I fix this? Image 1: Properties when Steering wheel software is not installed. 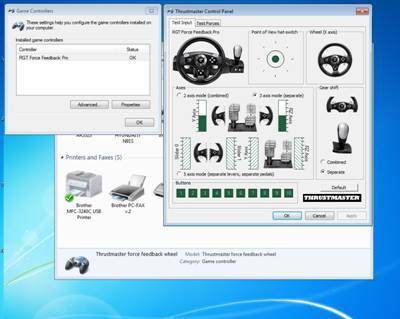 Image 2: Properties after Steering wheel software installed (example-Thrustmaster), access to Settings available. A: Please make sure you have the software and driver for your steering set installed properly – these will be provided with your steering set by the manufacturer. Make sure that the Settings in the Properties of your steering wheel set have the “Pedals reported as combined” unchecked. If you cannot see settings in the properties, you need to install the steering wheel software. To make sure the steering wheel software has been installed, go to your computer Control Panel > Devices and Hardware > Gaming Device and find the name of the steering set that you have plugged into your computer. If the Properties of the steering wheel look like the first image, with only circles that detect input, then the software has not been installed. When the software is installed, you will see a detailed input detection specific to your model of steering wheel. Here you can change the settings of your wheel. Q: I have Windows 7. When I tried to install my steering wheel (F430), I got an error “device will not start”. It looked like it had successfully loaded the driver, but there was some other problem and it wouldn’t work. I updated Windows and also tried downloading the driver directly from the Thrustmaster website all to no avail. A: Please do not plug your steering wheel into either a USB 3.0 jack or a USB hub. Neither of those options will work with this steering wheel, it has to be plugged directly into a USB 2.0 jack. Q: Does Driver Education Suite 2012 Home Edition support force feedback wheels? In other words, will the game produce realistic tension in the wheels as they are turned? A: Yes. The force feedback is implemented in the program. It depends on the OS setting, the steering wheel type and the wheel setting. If you do not feel the FF on your wheel, and your steering wheel supports FF and is compatible with your Windows, install this patch (compressed, so unrar it first); this should enforce to activate your steering wheel force feedback. Q: My vehicle and terrain selection menu is empty and I cannot change my vehicle type or terrain. A: Occurrence: Rare. SimuRide is not seeing some important folders; this is caused by a setting in your Windows Explorer. Please go to your C: drive and select Properties/General and check the last box that reads “Allow Indexing Service” to index this disk for fast file searching. Your SimuRide program will come with a Manual file in the software package. Consult this document when installing and configuring your SimuRide. Your steering and other external hardware will come with instructions. Consult these instructions when installing and our document when configuring your hardware to work with SimuRide. There are some common errors that occur to help you determine which settings need to change or which installations need to be epeated for the SimuRide to run smoothly. While we have settings within the program that help slower computers run SimuRide smoothly, please compare your hardware specifications to our minimum requirements. Q: I am using three monitors and I am getting an error when I start. There is no SimuRide Display Resolution that matches my Windows resolution. A: If you are using three monitors, there is an extra step in the screen resolution set up. Your computer’s screen resolution will now have a horizontal resolution of three times the normal size. Divide the larger number of your computer’s screen resolution by three to get a number that will match the list in SimuRide; an example 3x(1280) x 1024 = 3840 x 1024. Please make sure you have installed all necessary drivers for your graphics card and the Triplehead2go. Q: The gas pedal does not perform properly. How can I fix it? A: Please follow the instructions to setup the steering wheel and install all necessary drivers for it. Q: My car accelerates very slowly and unrealistically. What can I do to fix it? A: Please check that your computer meets the requirements that are found on the back of the SimuRide CD cover or online on the product page. 3) Setting > Reduce distance to view objects. If these settings still do not increase performance, you have a computer with less than the minimum requirements; hence, you will need to run SimuRide on a computer with at least the minimum requirements. Q: My Logitech steering wheel and pedals are not working. I don’t have the option to change ‘degrees of rotation’ and other properties suggested in your manual. How do I fix it? A: Make sure you have followed the installation instructions from Logitech when installing the wheel set. Your operating system may not have the software to let you modify the steering wheel property; this software should be provided by the steering wheel manufacturer. After this software is installed you will be able see the options we outlined in the manual. Q: What should the resolution be? 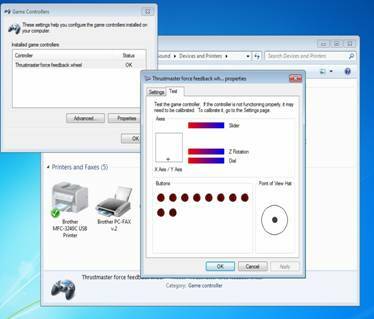 A: The resolution depends on your monitor size and the resolution your computer supports; therefore, you have many of different resolutions to select from the list provided by Simuride. Ensure that the resolution selected in the simulator is the same as the resolution selected in Windows. Q: Where is the Skid Control? A: Version 2009 and up has Skid Control included in main installation package. 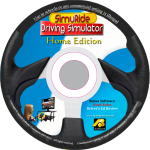 Using Version 2008, please install the update that is on the SimuRide disc. Q: I am getting an error message that reads “Windows cannot access the specified device, path, or file. You may not have the appropriate permissions to access the item.” The Dongle key is in the USB port and I am logged on as administrator. A: Your operating system may have a setting that only opens music files (example) in your DVD drive. Go to My Computer > DVD Drive and right click to select Properties. Select Autoplay/General tab and change the settings to allow your computer to open the correct file types. Q: We are attempting to install your software on a PC for inmates in a federal prison and need to limit access to only those processes required for the program to run. The installation will be on a Windows XP SP3 PC. Can the users accounts be only given the “User” access control level group? Or do they need “Administrator” or “Power User” levels? A: The software has to be installed with the admin privileges; any user type after that can use the program. If the computer is exposed to the public, please hide the USB Key (your non-replaceable license) inside the computer, using short USB extension cable. Q: I have Windows installed on my computer, but your program doesn’t work? A: Our software is protected against copying by Micro vision Corporation. As a result of that, there can be two reasons why you cannot open our application: Micro vision does not support older versions of Windows than Windows 98, or you are not a computer administrator (you have to be logged as an administrator or must have computer administrator rights granted as a user of our software launched before 2007). If you are a home user of your PC, there should not be a problem, as you are an owner/administrator, but if you are using a computer at work or school, you may not have administrator rights. Many companies’ or libraries’ computers are connected to a network protected by administrator; you are there only as a user and you will be not able to run our earlier (before 2007) application. However, you can always ask your administrator for a higher privilege level. Q: 8 days ago I ordered one of your CD-ROMs; why I haven’t received it yet? A: Please wait few more days; it may take up to 9 business days to receive your order. Same of our products ship to other countries, Custom Officers can hold up shipments causing them to be delayed for a week or two. We thank you for your patience.